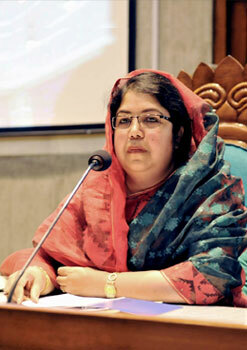 Dr. Shirin Sharmin Chaudhury, MP, the their International Affairs Secretary of the Awami League, was elected MP from one of the parliamentary seats reserved for women on March 24, 2009 and was State Minister of the Ministry of Women and Children Affairs (Bangladesh) until her nomination for Speaker of Jatiya Sangsad in April 2013. Dr. Shirin was awarded Asia Society’s Humanitarian service Award on 9 June 2010 in recognition of her role as a leader in advocating the elimination of violence against women and mainstreaming women’s empowerment and employment in Bangladesh. Dr. Chaudhury received this award from Ambassador Melanne Verveer,then US Ambassador-at-Large, Global Women Issues in a gala award ceremony at the Ritz Carlton Hotel in Washington DC. On January 28, 2014 Dr. Shirin was elected MP from the Rangpur-6 constituency that had been vacated by the Prime Minister, Sheikh Hasina after the January 5 elections. Dr. Chaudhury was uncontested in the by-election and was nominated for Speaker by Awami League the very same day. She took oath as the Speaker of the 10th Parliament on January 29, 2014, becoming the first person to remain Speaker across two consecutive tenures.